Rapidly growing corals can interfere with both water circulation and light reaching their inner branches and other nearby corals. In other words, the conditions that allowed the fragments to grow rapidly are altered by their growth patterns. One hears too often, my reef was thriving, with everything growing, and then it crashed. 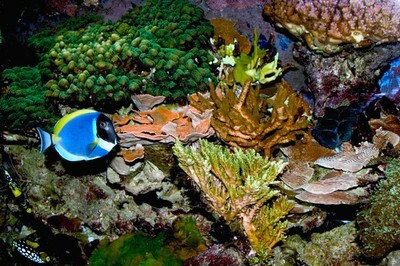 Both in Nature and in our small reefs corals can often be their own worse enemies. In Nature they are on a suicide mission, growing toward the light – the Sun – but also toward the atmosphere where they will be destroyed by wave action, desiccation, UV, heat, etc. However, the situation in our reef tanks is different. 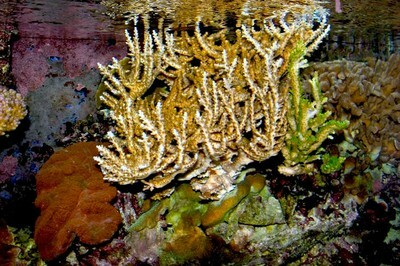 Corals, when healthy, grow very rapidly, increasingly making it difficult for water circulation and light to reach them. This can generate stress, often leading to a crash. Of course, there can be many other reasons. But, reading Charles Delbeek’s Media column this month got me to thinking about growing corals and water motion. In his column Charles wrote, “The following two articles support the observation that good water flow is an essential component in a successful reef aquarium that houses a lot SPS corals such as Acropora and may help to prevent coral bleaching brought on by increased water temperatures and light levels.” I suggest you read Charles’ column carefully; it might save you from a crash. We all know that it is much easier to start a fragment than a whole colony, letting the fragment adapt to the environment we provide, but what we may forget is that growing corals change the environment that they adapted to by their growth patterns. They may grow to the point where they cannot get the water circulation and or light that they need to survive. To avoid a crash we may need to increase light and water circulation and periodically thin out our corals. This may be one of the reasons that we too often hear, just before the crash everything seemed to be doing so well. Ron Shimek raised most reef keeper’s anxiety level a few years ago by claiming that our reef tanks were sinks for the accumulation of toxic heavy metals. In part 2 of his series “Is It In The Water?” Richard Harker confronts Dr. Shimek’s controversial position with data of his own. The beauty of science is that, when confronted with new data, it is self-correcting.